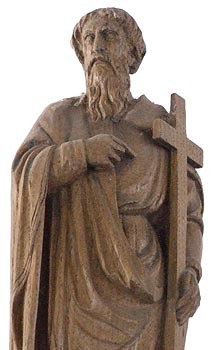 According to Geoffrey of Monmouth, Amphibalus was the name of the underground Christian priest, sheltered by Britain's protomartyr, St. Alban, at his house in the Roman town of Verulamium (now St. Albans). The latter took his place when the authorities arrived to arrest Amphibalus. He suffered execution for his trouble. Bede describes these events as occurring during the religious persecutions of the Emperor Diocletian (c.AD 304), though modern historians have argued the reigns of Decius (c.AD 254) or Septimus Severus (c.AD 209). Unfortunately, though Amphibalus may have existed in person, this was almost certainly not his name. Rather, the word is a misunderstanding of the Latin used for the cloak from which Alban created his disguise. All other details of the man's life are, no doubt, later medieval embellishments. He was supposedly a native of Isca (Caerleon), converted numerous Romano-Britons after his brush with death - including SS. Stephanus & Socrates - and fled with them to western Britannia Superior (Wales). He was, later, caught and returned to Verulamium where he too suffered martyrdom on 25th June. Amphibalus' body was supposedly discovered at Redbourne, in 1178, and translated to a fitting shrine in the Abbey Church of St. Albans. He is, doubtfully, said to have had a church dedicated to him in post-Roman Winchester.